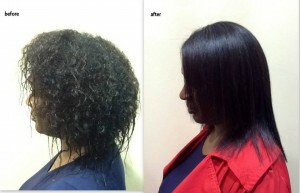 » News and Advice » TZ News » What Is You Pro Keratin Treatment System? Luster’s You Pro™ Keratin Treatment System is a low pH system that contains Natural Keratin extracted naturally from plants. Keratin forms the natural protein bond of the hair.These bonds are often damaged due to abuse from chemicals and heat styling. Some “Keratin” products on the market actually contain Formaldehyde or Thioglycolate to treat hair. These chemicals usually do more harm than good to already damaged and weak hair. You Pro™ Natural Keratin penetrates the hair from the cuticle all the way to the cortex to actually infuse this natural keratin protein on top of the existing keratin bonds. This non-chemical action does not breakdown the protein bonds of the hair. Instead, it Fortifies, Heals, Repairs and Strengthens the hair from the inside out, thus promoting healthy hair growth. The end result is stronger, smoother, healthier, well conditioned, and great looking hair. And it’s all safe. This treatment system offers flexibility and versatility in styling. Your clients can achieve straight styles, curly styles, wavy styles….all in one application. No waiting 48 hours to complete the treatment.….AND, if your clients desire, can color their hair during the Keratin Treatment. Every application of this product will leave your clients’ hair stronger, easier to comb and to style. FOR ALL MULTI-CULTURAL HAIR TYPES AND TEXTURES. Very effective hair cleanser gently and thoroughly removes dirt and other foreign particles from the hair in preparation for the You Pro™ Strengthening Mousse Treatment. YOU Pro™ Strengthening Mousse™ penetrates and adds extra layers of protein to the cortex to Strengthen, Repair and Condition hair fibers (bonds) from the inside out while helping to promote hair growth. Imparts the proper moisture balance needed for healthier, shinier and manageable hair, while also smoothing and detangling hair for easy combing. For optimum results, use with YOU Pro™ Moisture Infusing™ Conditioner. Rich with essential oils and Vitamins for maximum moisture and conditioning, leaving hair manageable and easier to comb. Vital conditioners restore nutrients to help strengthen and smooth hair for greater flexibility and shine and body. A versatile creme conditioner that protects the hair from direct heat treatment and can also be used as a daily conditioner. It also seals the cuticle to lock in nutrients and minimize color fading, smoothes the cuticle for tangle free combing.